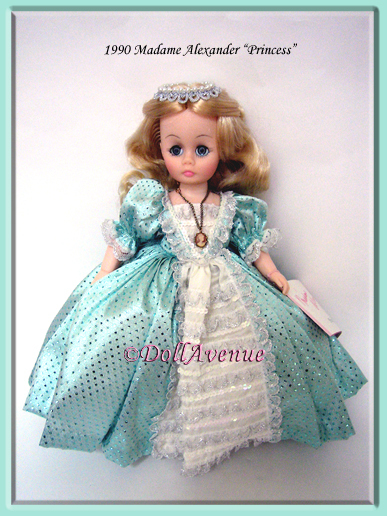 Catalog > Madame Alexander "Princess"
1990 12" Madame Alexander doll "PRINCESS" #1304 with long blonde hair, blue-gray eyes, peaches and cream complexion and pink lips. She is wearing her original tagged shimmery teal gown with a white ruffled inset trimmed in white sequins and silver lace. Under her dress she wears a layered white crinoline, taffeta pantiloons trimmed in lace, white shimmery tights, and silver slippers. On her head she wears a pearl and silver beaded crown fit for a princess! She will arrive in preowned, excellent condition with her original box and handtag. The box is in good condition with cardboard insert and pink tissue.